Notes from the Road | Urban design solutions for Connecticut, New England and the world. After announcing that the city had lured the New Britain Rock Cats, a Double-A Minnesota Twins affiliate, to a new home 15 miles a way in Hartford’s beleaguered North End neighborhood back in June, Hartford Mayor Pedro Segarra has withdrawn a $60 million plan that would have financed a new stadium using public funds. 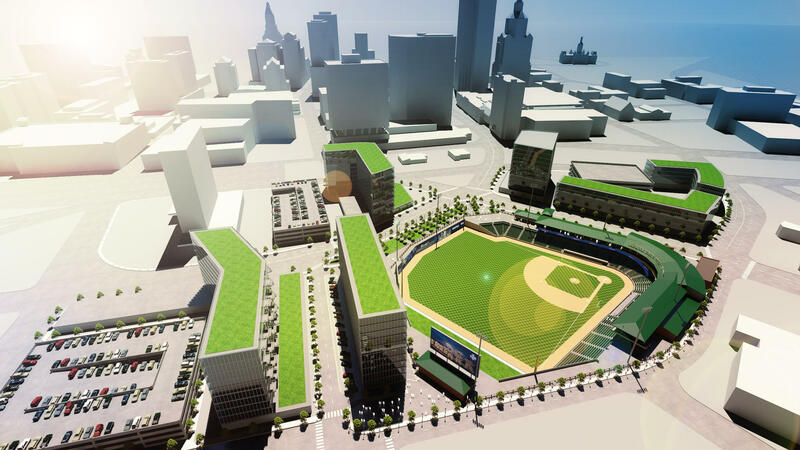 City officials issued on July 2 a request for proposals for construction of the baseball stadium and downtown retail and residential development. The request indicates that Hartford will open bids on Aug. 1 — the deadline for developers to submit their plans — and award the contract on Aug. 18. Officials involved with the CTfastrak say the 9.4 mile busway from New Britain to Hartford is on track to open in March 2015. The Department of Transportation estimates construction of the 10-station system is around 70-75 percent complete. Once the busway is rolling, DOT estimates it will eventually generate 16,000 rides daily and 4 million rides a year. 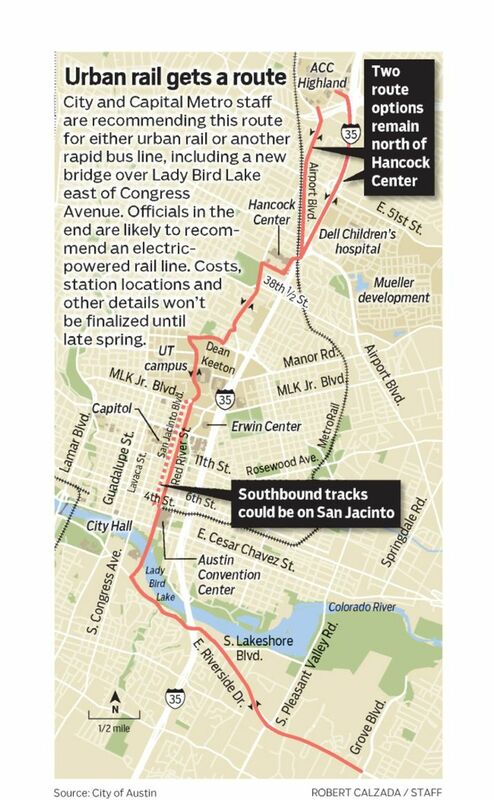 Ben Wear – Officials proposed a nine-mile route that would run from the emerging Austin Community College campus at Highland Mall through the University of Texas, downtown and along East Riverside Drive to Grove Boulevard. The proposal is expected to take final form this summer, where the Austin City Council will decide by August whether to put a bond proposal on the November ballot. At the moment, there are a host of unknowns: the cost of construction; annual operating costs and what entity or entities would cover those costs; who will run the line; where the train would have its own dedicated corridor; and where stations would be located. A huge question mark is how and when the line will cross Lady Bird Lake. The final recommendation that will be put to the City Council, along with details about stations, train technology, financing and governance of the line, is expected emerge by April. The proposed Violet Crown Trail is a 30-mile network of trails from Zilker Park to south of FM 967 in Hays County. So far, the trail’s first phase — 5 miles of walkways in Zilker Park — has been built. Attention is now focusing on the second phase of the trail, a 7-mile segment that will link Sunset Valley to the Veloway, a popular closed cycling and skating loop, and the Lady Bird Johnson Wildflower Center. Construction is expected to get underway by early summer. For more information, see here. Council took the issue of so-called “stealth dorms” to task, passing a resolution to lower the number of unrelated adults allowed to live in a single-family home from six to four. Some argue these living arrangements provide affordability for Austinites because of the rising price of Austin real estate, while others say they lead to parking and trash problems that disrupt neighborhoods and lower property values. 1. Ender’s Game and Battlefield Earth? I bet you didn’t know the Mormon millionaire was such a nerd. The Sci-Fi affinity also comes out under favorite films, where he lists Star Wars and Raiders of the Lost Ark. 2. Mitt’s musical tastes officially define him as the whitest person in the world. Even country music fans don’t like Clint Black. 3. Mitt’s okay with blue-state shows like Modern Family, 30 Rock and Seinfeld. 4. He loves music, movies and Myspace. His profile includes an old Myspace account from 2008, three Internet streaming services and an inexplicable link to IMDB. I love Wolfram|Alpha, a kind of search engine for quantifiable facts, and their new feature allowing people to analyze themselves for free has got me buzzing. And because I’m a narcissist, I’m going to analyze my data here on Notes for the Road. For example, I’m post less than I used to, but 82% less? Apparently. April 2011 was my high-water mark and I posted 28 times that month (statuses, photos, links); in August I posted 5. I’ve always been a heavy user but light poster but that’s quite the decline. I suspect I’m far from the only one. Also of note, the amount of links I post has declined in relation to my status and links, but photos have remained the same. So am I using less or just posting less? It’s important distinction. I wish Wolphram would tell me statistics on how much time I spend actually logged in. What about the frequency of my posts? Do I “like” more things than I did compared to a year ago? Brands vs. people? Are you posting less than you used to? 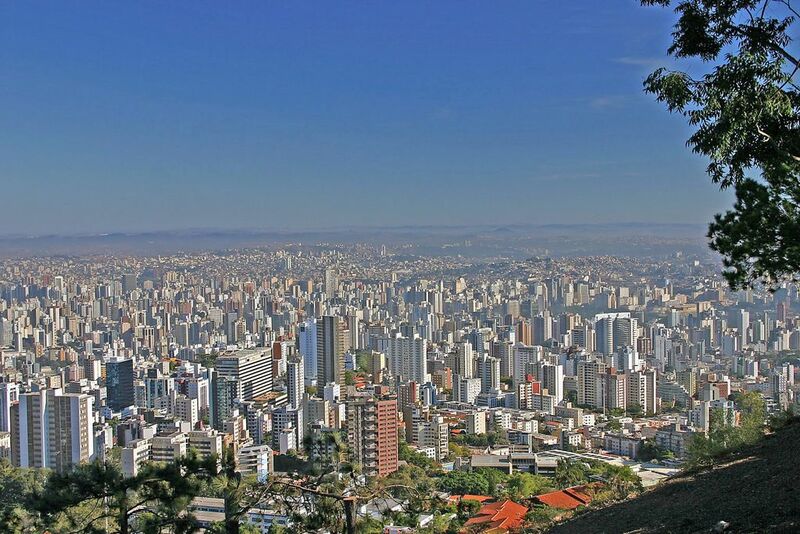 Long before Brasilia, Belo Horizonte was Brazil first planned city. The country’s third-largest, it was developed in the 1890s when the state capital of Minas Gerais was relocated from Ouro Preto. Today it is a sprawling city filled with an eclectic mix of neoclassical, modernist and contemporary architecture. Parque Municipal, Belo Horizonte’s central park, is located at the city center. 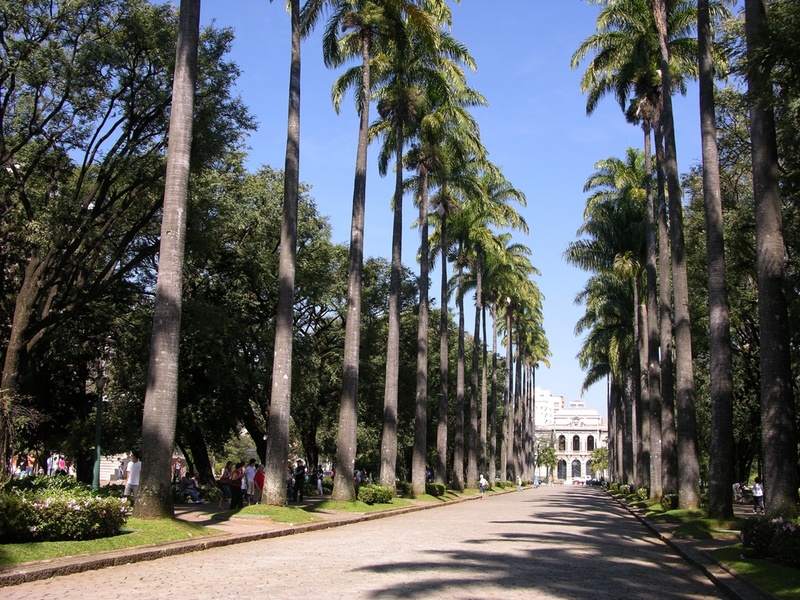 Praça da Liberdade (Liberty Square) is the city’s main square. Modern “Beagá” features a mixture of contemporary and neoclassical buildings, and hosts several modern Brazilian architectural icons, most notably the Pampulha Complex. Belo Horizonte was laid out as a neoclassical city, modeled on the grid system, and Aarão Reis sought inspiration in the urban design of Washington, D.C, and Paris. This is evident in BH’s wide, tree-lined avenues and the prominence of parks and squares in urban life. Belo Horizonte has an octagonal urban network cut by diagonals and is “closed” by a circular ring, the Perimeter Avenue. 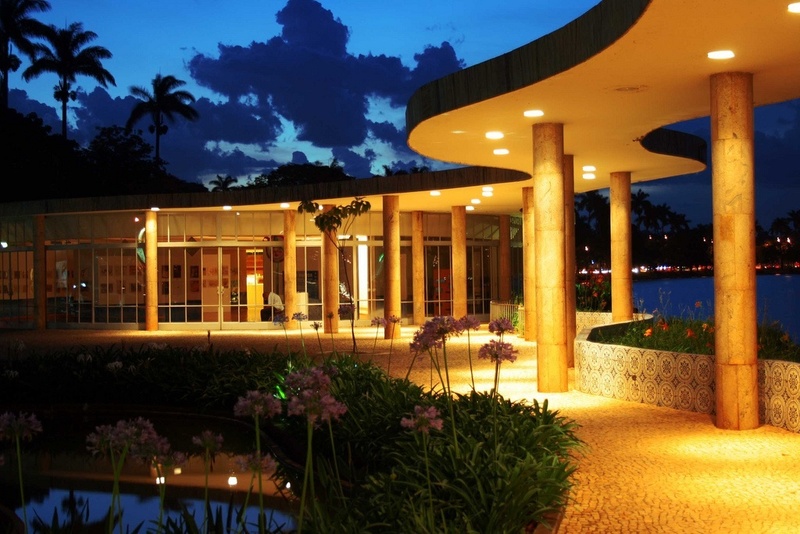 Museu de Arte de Pampulha, formerly a casino. Igreja São Francisco de Assis. Photo by Pedro Kok. The 1940s and 1950s witnessed the physical and demographic expansion of the city past the original boundaries envisioned by Reis, which was translated into the creation of new suburbs, such as Pampulha and Cidade Jardim, the residential areas of the elite. 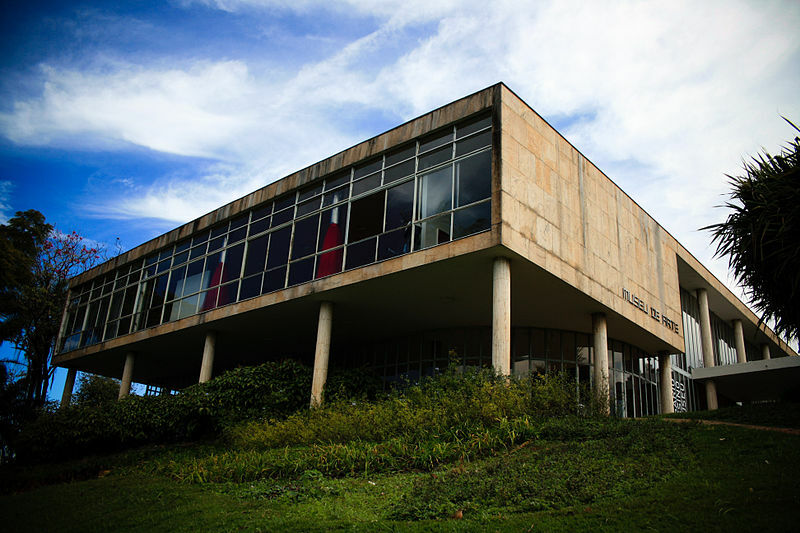 In 1941, Juscelino Kubitschek de Oliveira, then the Mayor of Belo Horizonte Brazil, asked his young friend Oscar Niemeyer to design three buildings for a new suburb that Kubitschek wanted to build in Pampulha, a neighborhood named for the attractive lake at its center. Completed in 1943, the project was a trio of buildings set around the lake. The first was Igreja de Sao Francisco de Asis, another a dance hall and restaurant on the lake and the third a large casino. Together they set the tone for the development of that district. With its hangar shaped design, the Igreja de Sao Francisco de Asis is easily the most impressive. As the first listed first listed modern architectural monument in Brazil, it consists of four undulating concrete parabolas with outdoor mosaics. 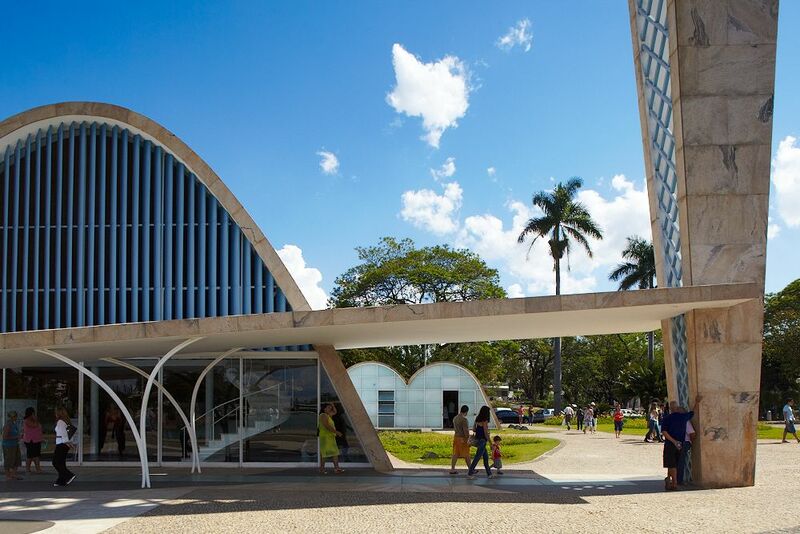 Niemeyer was inspired by French poet and diplomat Paul Chandel, who called a church ‘God’s hangar on earth.’ The church was not without controversy and would not be consecrated until 1959. Brazil’s third-largest city is well below the international radar compared with Rio and São Paulo. But things are changing in Belo Horizonte, as the economic boom continues to attract major national and foreign investment to the city. The resulting rapid urbanization and economic boom has left its mark on the city’s urban geography, as skyscrapers sprout up around the city and traffic increases.